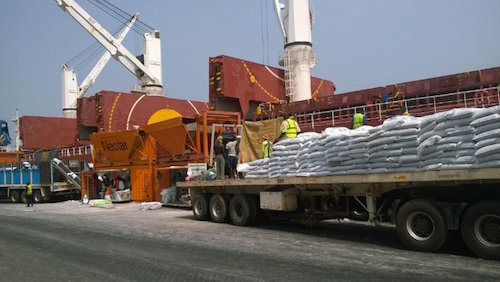 Custom fines for discrepancy between quantities manifested and the final stevedores' figure have been a potential issue for bulk vessels trading in West African countries, especially in countries such as Benin, Togo and the Ivory Coast which have a high demand for imported bagged commodities like sugar or rice. In the following we provide information on fines that can be imposed on vessels calling at Lomé, Cotonou or Abidjan and our recommended best practices to avoid delays upon completion of discharge. Bulk vessels discharging bagged cargo in Lomé, Cotonou or Abidjan will often receive a message from their agent on arrival stating that when a vessel is calling one of these ports the agent need to provide a copy of the cargo manifest within 24 hours after the vessel's arrival and that, in case of discrepancy between the quantity manifested and the final stevedore tally's figure, a custom fine will be imposed. As the vessel's agent is responsible for the payment of the fine on behalf of the vessel it is common, before completion of discharge, to receive a request for the issuance of a letter of undertaking (LOU) to cover the amount of the potential fine. The LOU request will be based on the estimation of the potential fine plus a usual uplift. What are the local custom regulations? As an example, in Togo, the fine is calculated based on the local market value estimated by local customs plus the difference accounting for the duties that should have been paid (on average 30% on the market rate) plus a fine. The Togolese customs code (Art. 327) states that a fine amounting two to three times the amount of duties and taxes evaded will be imposed in case of discrepancy between the quantity manifested and discharged. Before 2013, no amendment could be made by the vessel agent once the quantities manifested were declared to the customs upon vessel's arrival. If any discrepancy between the quantity manifested and the final stevedore's figure was found upon completion of discharging operations, a fine was imposed but in 2013 the main Togolese vessel agent association and the Togolese Customs reached an agreement allowing the vessel agent to amend the declared cargo manifest up to 48H after vessel departure for bulk vessels. This will allow for more flexibility and does reduce substantially the number of custom fines. A similar article in the Benin custom code (Art. 89), states that within 24 hours of the vessel's arrival, a summary declaration of the cargo manifest shall be presented to customs by the vessel's Master or his agent. This declaration will be registered in SYDONIA (an ASYCUDA computerized customs management system that handles manifests and customs declarations) but contrary to the agreement reached between vessel agent and customs in Togo, once recorded no changes are allowed. In Ivory Coast, under Art. 267 of the Customs Code, the Master is liable for any error in cargo manifest declaration and Art. 285 states that a fine will be imposed in case of discrepancy between the quantity manifested and discharged. And, like in Togo and Benin, the local practice if for the customs to consider the stevedores' tally as final figure. Given the short time allowed to amend the information, and given that bulk vessels can spend more than a week discharging bagged cargo and even longer during the rainy season, it is very difficult for the vessel agent to amend the declaration on time. The estimated fine amount can, therefore, be potentially quite high depending on the discrepancy found. Further, since the vessel agent will be the sole responsible party towards customs for payment of the fine on behalf of the ship, agents will require vessel's P&I or his local representative to set up a letter of undertaking (LOU) for the full amount of the potential fine, plus a usual uplift. While the agent will need to spend time and costs to lawfully arrest the vessel, the vessel out clearance will usually not be given before the LOU is received, thus causing potential delays and a subsequent potential claim for loss of time between Owners and Charterers. Ask the vessel agent to confirm in writing in advance all latest customs requirements before calling West African ports to discharge bagged cargo. Appoint a protecting agent to double-check the stevedore's tally. Although the sole final figure taken into account by customs is the stevedore's tally, appointing a protecting agent to supervise the discharging operations can be helpful to control potential irregularities. Ensure that the Master contacts the vessel's P&I or the local correspondent immediately when there is a risk of fine: anticipation will be the key to avoid delay in vessel's departure after completion of discharge. As the time used by local customs authorities to negotiate the amount of the fine can vary, it is important to liaise with our local correspondent to get updates from the vessel's agent and the customs authority as to when the final amount has been negotiated, and to request a receipt a release after the fine has been settled. In addition, Owners and Charterers can negotiate the issuance of LOUs for customs fines related to manifest discrepancies in back-to-back charterparties. Finally, while the vessel agent will first request a LOU from the vessel's Owners P&I club, he will usually also agree for the LOU to be issued by a well-established local correspondent instead. The agent can alternatively agree to get a LOU from the Owner or the Charterers.